Thanks to Iontach here on Ravelry for mentioning a few errors in the pattern charts. I’ve updated the pattern and uploaded a new version to my website and took the opportunity to provide a free Ravelry download as well. Enjoy! 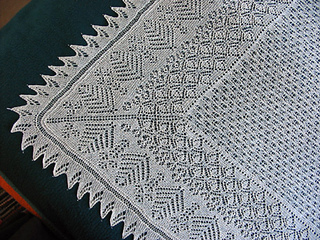 This is a classical Shetland shawl as far as it consists of a center square knitted back and forth, a wide border and an edging attached sideways. I took advantage of the wonderful invention of circular knitting needles making nearly seemless and in-the-round construction possible. The ground pattern is ‘butterflies’ from Harmony Guides 450 Knitting Stiches Vol 2. I just love this stitch. It is a stockinette based pattern. 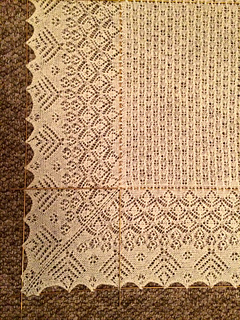 The border is composed of stitches from Sharon Miller’s Heirloom Knitting. It starts with ferns, continues with spiders runnig from the ferns to the trees. Between the trees I placed some flowers. The border is garter stitch as is the edging. The fern edging is also from Miller’s book. 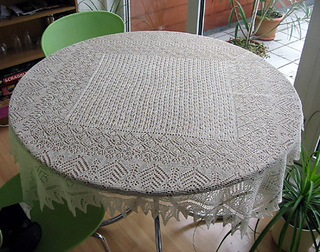 Knitted in this wonderful swedish linen thread (originally intended for weaving, I suppose) it makes an excellent tablecloth. 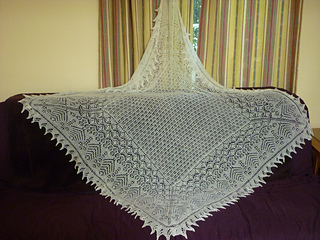 Choose a fine or even a slightly heavier wool yarn and you will end up with a beautiful shawl. Gauge is not of the essence as is often the case with lace projects. Just make sure your chosen yarn and needles result in a nice fabric - not too dense and not to open to show off the stitch patterns nicely. The pattern might not be suited for an inexperienced novice in lace knitting since not all and every tiny detail is spelled out and written down.